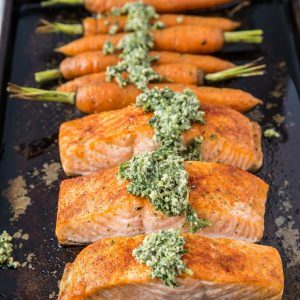 Quick and easy sheet pan salmon and carrots with homemade carrot top pesto is a goof-proof healthy weeknight meal. This recipe comes together in just 35 minutes! I had a reader request sheet pan recipes recently and I am so thrilled to help out in this department. One-pot or one-pan meals are my jam, because let’s face it: I love keeping meal time as quick and easy as possible. Of course, that includes the post-meal cleanup. If you’re a regular here, you have probably surmised salmon is my favorite of all the animal proteins. 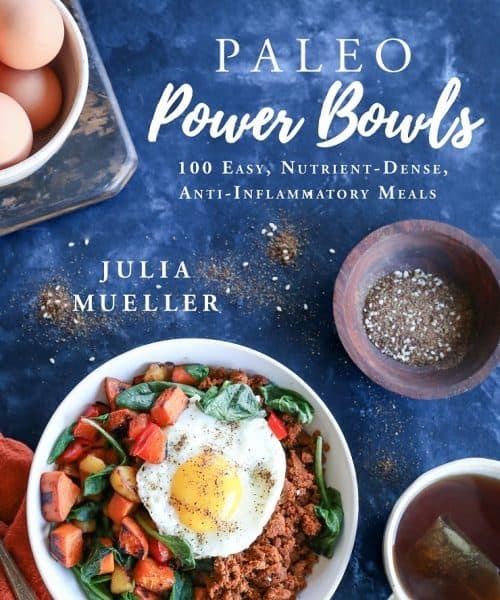 I eat it multiple times per week every single week with some form of roasted or sauteed vegetables, but of course! You can take a look at my salmon archives to feast your eyes on all the salmon-ness! Simplifying my own approach to salmon and roasted veggies as much as possible, I thought it would be nice to whip up a super straight-forward meal that requires few ingredients yet still has the appeal of a fancy date night meal. 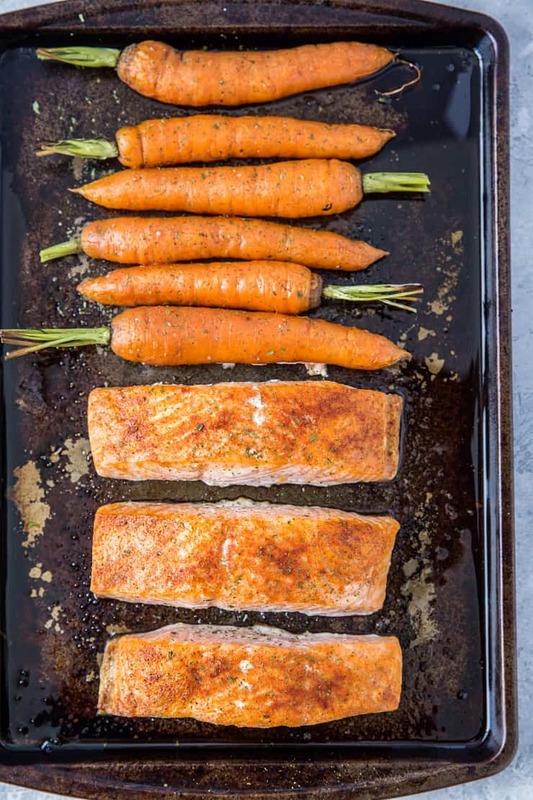 Okay, this Sheet Pan Salmon and Carrots recipe may not be fancy, per se, but you’ll impress yourself with how easy and delicious it is. I’m willing to bet it will become a staple in your own home! This recipe is easy as can be! Lightly oil or spray a large baking sheet. Place the salmon fillets on the baking sheet and sprinkle them with sea salt and paprika. Place the carrots on the baking sheet and drizzle liberally with oil. Use your hands to coat the carrots in oil. Sprinkle the carrots with sea salt. Bake in the oven for 25 minutes, or until the carrots and salmon have reached desired done-ness! While the salmon and carrots are roasting, prepare the carrot top pesto. If you have never made pesto sauce using carrot tops, I absolutely recommend it! The flavor turns out herby and earthy. Just like any pesto, you can also add fresh basil, parsley, or any of your favorite fresh herbs. I’m partial to the combination of carrot tops, fresh basil, and roasted walnuts. 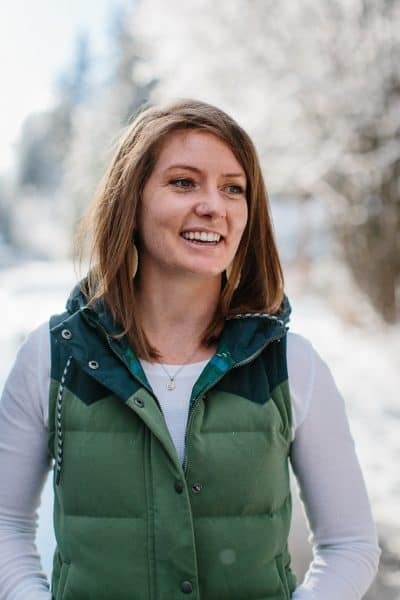 Note: If you buy your carrots without the tops, you can also make my Low-FODMAP Pesto Sauce, Broccoli Pumpkin Seed Pesto, Basil Pesto Sauce Recipe, or Roasted Beet Pesto. You have options! Just like the herb selection, you can change up the nuts or seeds you use. Roasted pecans, almonds, pine nuts, and pumpkin seeds are great! Cut the tops of the carrots off and wash both the carrots and the greens well. I blanch the carrot tops in boiling water just to be sure there aren’t any unwanted critters on the greens, but if you trust your carrot source, you can leave the greens raw. Roast the walnuts in the oven until they’re nice and toasty. Add all the ingredients except for the oil to a food processor and pulse to chop. Stream the oil through the top of the food processor. If you like a thinner consistency, simply add more oil! 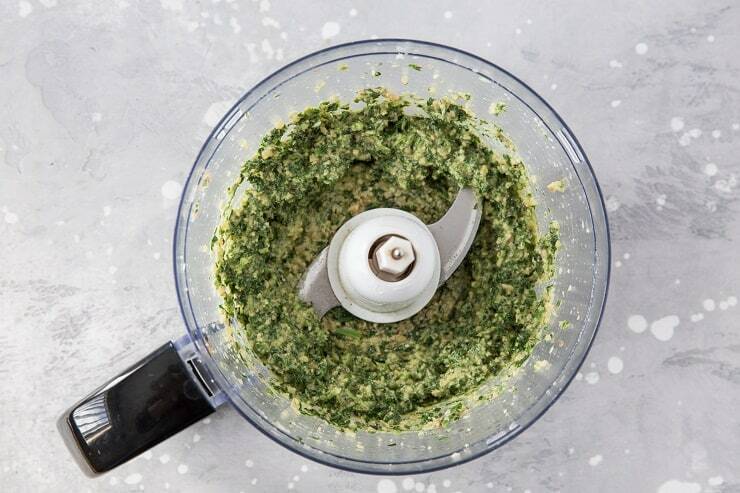 Add ½ cup grated parmesan cheese to the pesto if you do dairy. Add 1 to 2 cloves garlic to the pesto if you don’t follow a low-FODMAP diet. Sprinkle the salmon with onion powder and garlic powder if you don’t follow a low-FODMAP diet. 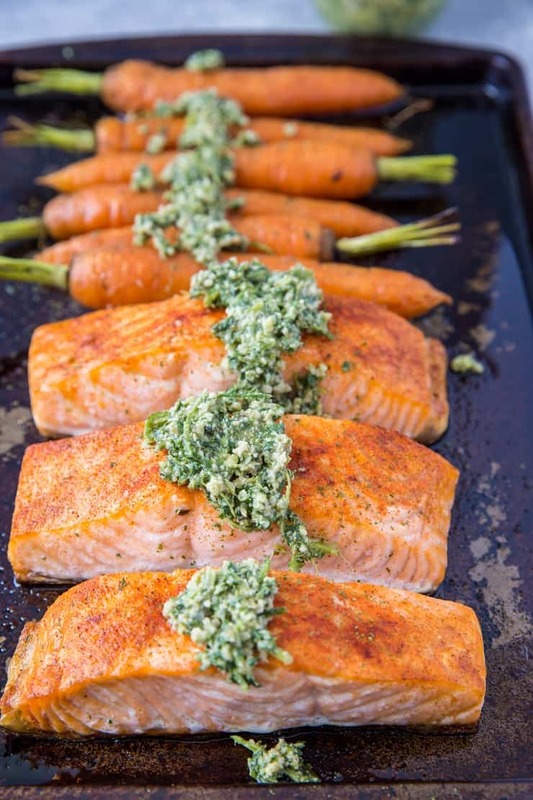 If you make this Sheet Pan Salmon and Carrots, please feel free to share a photo and tag @TheRoastedRoot on Instagram! Sheet pan meals on repeat! Preheat the oven to 400 degrees F and lightly oil or spray a large baking sheet. 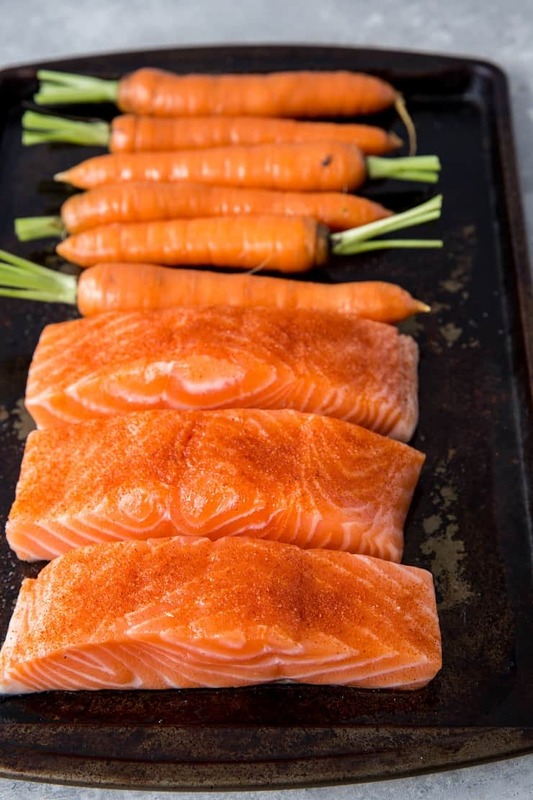 Place salmon fillets and carrots on the baking sheet. Sprinkle the salmon with sea salt and paprika. Drizzle the carrots liberally with avocado oil (or olive oil) and use your hands to coat carrots in oil. Sprinkle carrots with sea salt. Place sheet in the preheated oven and bake for 25 minutes, or until salmon is cooked through and has reached desired done-ness. 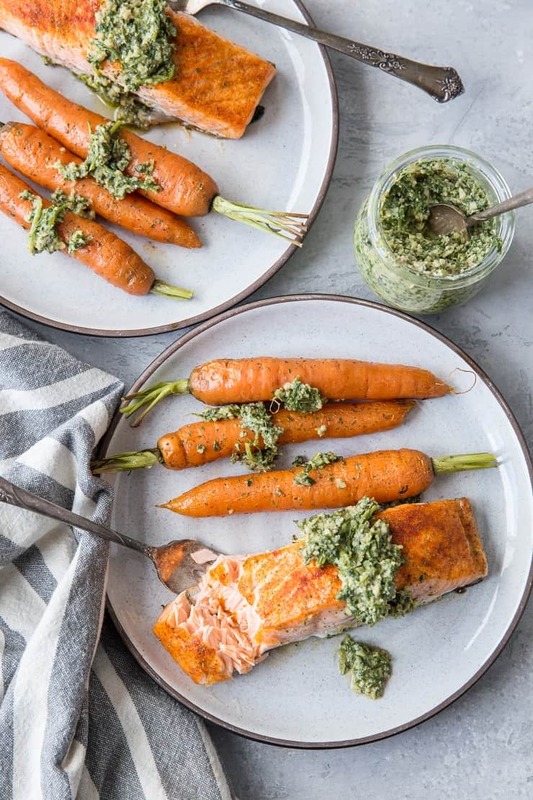 While the salmon and carrots are baking, prepare the carrot top pesto. Spread the walnuts on a baking sheet and bake 3 to 4 minutes, until golden brown. Remove from oven and allow walnuts to cool. Add all ingredients for the pesto except oil to a food processor and pulse to chop. Note: remember you can add garlic and parmesan to the pesto if you are tolerant of either or both. Leaving the food processor on, stream the oil through the hole in the top until desired consistency is reached. Add more oil for a thinner sauce. 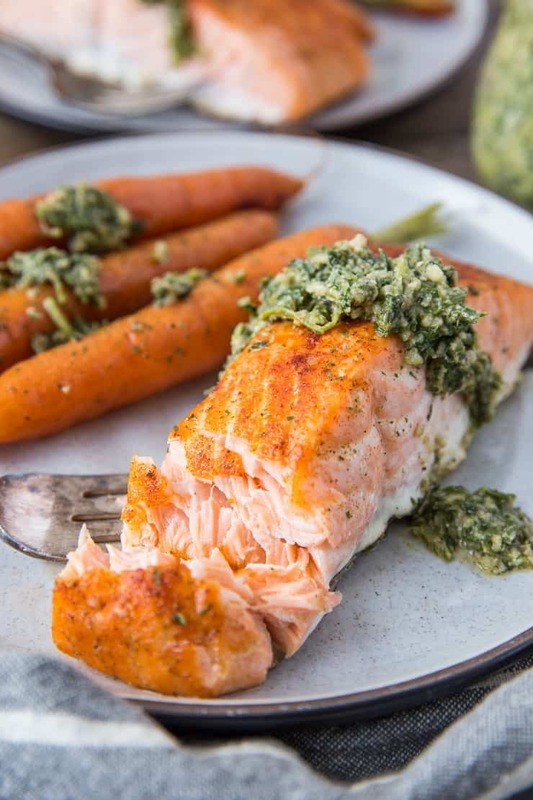 Serve salmon and carrots with carrot top pesto drizzled on top.